We are sold out of lambs and sheep for sale until our next lambing, this spring 2019. Thank you to all of our customers both regular faces and new ones! We take deposits year round if you want to reserve any lambs from this spring's crop. We have had a closed flock since 2009 with our foundation stock coming from KBarK Farm in Pennsylvania, until we recently added 2 new rams (summer 2016) to bring in some new blood from a farm in Indiana called, Hunter’s Dorsets. We have been pleased with the weight gain of our lambs using the new rams and continue to have great lambing results, with little to no health issues, and a high tolerance against parasites. Our rams are pictured below. Dorset sheep are known to be a very friendly breed with calm temperaments and great mothering instincts. Their lambs have quick growth rates and do well even without added grain. However, we do grain feed our lambs to add a little marbling and flavor to their meet, mostly because we prefer the taste better. We have limited pasture for them to graze, so they are also supplemented with free choice hay year round. We like to spoil our flock, so they are all handled often and enjoy human company. Many of our customers comment to us on how friendly and sociable our lambs are after they take them home. 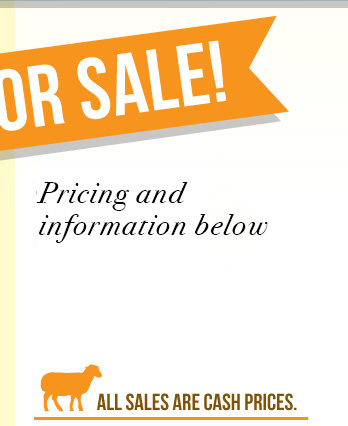 Feel free to contact us with questions or availability of lambs or sheep for sale. Since adding Dorset sheep to our farm we have been enjoying their great tasting meat and warm fleeces. The fleeces have proven their worth in the cold Vermont weather, and lend themselves to our wooden rocking chairs and cold car seats. We have them professionally tanned, and the suppleness of the hides give the fleeces an easy drape. As with any completely natural product, there are variations in color or texture which are completely normal. Each skin is unique and priced by size and condition. Average age of lamb fleeces is 6-12 months. All pelts are products of our sheep here at the NEK Sheep and Goat Farm.